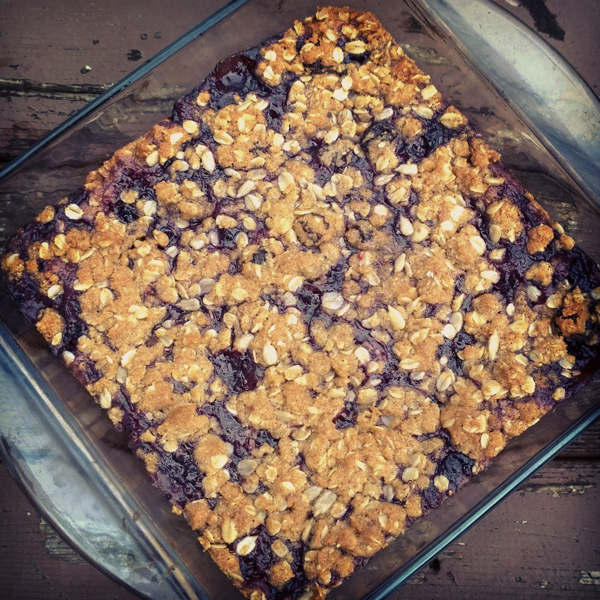 I was trying ideas for new granola bar recipes and made these – which are not a granola bar, but closer to dessert time. They are though quite delicious! Preheat oven to 325°, oil a glass 8×8 pan. Stir together oats, flour, baking soda, cinnamon, and salt together in a large bowl. Stir in sunflower seeds and cherries. In a small bowl whisk together oil and 3 Tablespoons orange juice. Add to dry and mix well. Reserve ½ cup of mix. Press remaining mix into p;an, gently flattening with hands. Stir remaining 2 Tablespoons orange juice into jam till smooth, spread over mix. Sprinkle reserved mix over top. Bake for 35 minutes, or until golden on top. Let cool in pan on a wire rack, cut into bars as desired. Wrap individually and place into freezer bag for longer-term storage.